Today has been extremely hot. 37 degrees C in the shade and about 40+ in the sun. The dogs have managed to survive it, just about, the cats did what they do best and slept all day but I am sad that one of my hens didn't cope! We now only have one hen, so I need to get some more quickly. I am certain it was the heat that killed her and nothing else. The other girl was ok, although panting a little. I am going to have to keep a close eye on her tomorrow as it will be another scorcher! I have decided that I might plant a tree in the coop, so that next year they have extra shade! I am going to spend a bit of time tonight researching 'things to do for hot hens'! The only girl left! I am sure she will be lonely till we pick up some more! I have given the plants an extra watering tonight also. Even though I was told by a local farmer only to do it every other day, but all the plants looked very dry and thirsty. 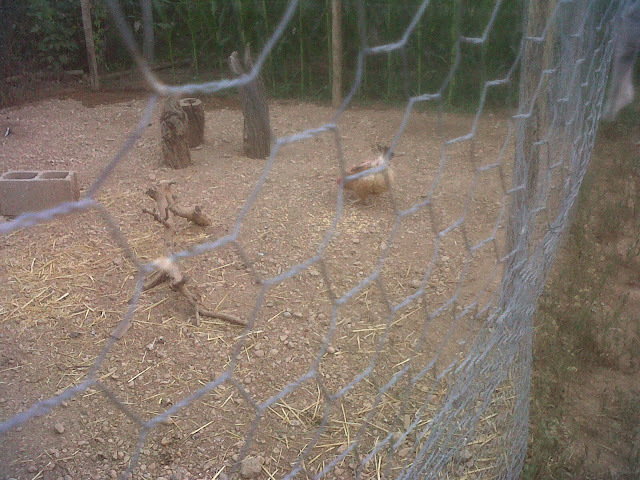 The corn is coming along, and in the afternoons now gives some extra shade in the coop for our remaining hen. 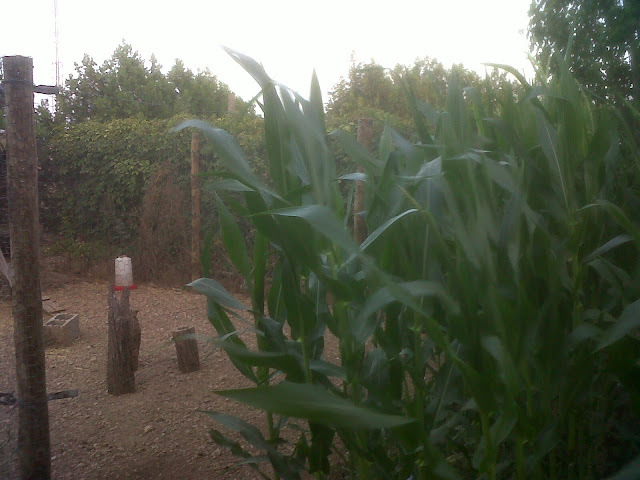 THE CORN - AS HIGH AS THE CHICKEN COOP NOW! Well, that's it for now really. We have a busy week coming up as we have guests arriving, but I expect I will put them to work in the vegetable plot at some point. At least our pool is functioning well this year! Keep cool and carry on..